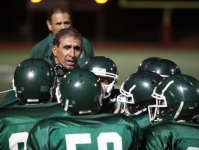 LEADING IN: Flag High’s woes from 2010 continued into 2011. Their losing streak from the previous year continued, ending at 14 games after a much-needed victory over Tuba City. Eddie Campos took complete control of the head coaching duties, but little changed over the year, the Eagles losing most of their games by large margins (including an embarrassing 52-8 loss to arguably the worst team in Division III, Glendale). They came to the Rivalry Game at 1-7, and though it was a game where records can be thrown out, the Flag High faithful weren’t in high hopes. Coconino, on the other hand, was having a very up-and-down year. They came to the Duel in the Dome at 4-4, both winning and losing big, playing with little consistency, but just well enough to come in with an even record. The high point of their season came with a 47-26 midseason win over Division IV contender Mingus, and there was even talk of sneaking into the playoffs. A tough loss to the always-tough Winslow Bulldogs told the story of their year: a game within reach, but too many turnovers at the wrong time led to failure. Still, the Panthers were in position to perhaps eke into the #16 spot with wins over Flag High and Chino Valley to end the season with six wins; it would be the first time since Coach Tadd Ragan’s first season the Cats made the postseason. While the Eagles were struggling to form an identity and create something positive they could hand their hats on, the Panthers were led on both offense and defense by Luke Daulton. He came to the Rivalry Game with 692 yards rushing and six touchdowns, and he did a little of everything on defense, forcing key fumbles, amassing tackles, and led the team with 8.5 sacks. His biggest game was against Mingus, where he rushed for 208 yards, scored two touchdowns, and sacked the quarterback one-and-a-half times. The Panthers were the overwhelming favorite and sought to repeat as city champion for the first time since 2003-2004, and with Daulton leading the charge on both sides of the ball against the hapless Eagles, there’s no reason to think they couldn’t. THE GAME: The Eagles drew first blood as Brandon Davis scored from seven yards out; with Scott Morrison’s extra point, Flag High was up, 7-0. The rest of the game belonged to the Panther running attack, amassing an incredible 365 yards on 54 carries. Luke Daulton led Coconino with 203 yards rushing and Timmy Teran added 104. By virtue of statistics, Coconino completely dominated Flag High, gaining 397 yards in total offense versus the Eagles’ 161. Turnovers, however, killed the Panthers, giving the ball up six times over the course of the game, limiting their chances to score. A Teran touchdown in the second quarter and a Daulton score in the third, coupled with Stephen Sorden PAT’s, put the Panthers up 14-7 deep into the fourth quarter. Despite being beaten in nearly every aspect of the game, the Eagles were able to hang around and stay within a touchdown of the Panthers. The clock wound down to under two minutes remaining, and in spite of all their mistakes, the Panthers were ahead and with the ball near midfield, just needing to gain a first down and kill the clock. As if an act of fate, a handoff was botched in the backfield, and Eagle D-lineman Kaine Kennedy scooped up the fumble and raced 40 yards before he was finally downed at the Coconino 2 with 1:17 left. The entire energy of the game suddenly shifted, as the Panthers, in firm control all game long, now had their backs against the wall. Flag High sophomore Cody Philpott’s 2-yard score made it 14-13 with just eleven seconds left. At that point, Coach Campos made the decision to not just settle for a tie against their archrival, but to go for two on a winner-take-all conversion. The Panther D bit on a fake handoff up the middle, and Dillon Gifford had clear sailing into the end zone on an end around, giving the Eagles an incredible 15-14 lead. Coconino QB Trevor Kortsen, who only threw nine passes all night, heaved a desperation pass in the final seconds, only to be intercepted. AT THE END OF THE DAY: Flag High Principal Tony Cullen, elated on the sidelines, called the game “the greatest win I’ve ever seen”; that’s saying something, as Cullen was a captain on the great 1981 Eagles team that won their first state championship in over forty years. Campos was looking for something, anything at all, to turn his program around, and this miracle finish may have done the trick. If it does prove to be the catalyst for improvement, it will be seen in 2012. The Eagles finished ‘11 at 2-8, losing at Page in th e finale, albeit by just a 16-13 score. Losing to both Winslow and Flag High killed Coconino’s slim playoff hopes; both games were winnable, but too many turnovers led to tough losses. Had they won those two games, they would have finished 7-3 and in the playoffs. Instead, they were fighting to just finish .500 as they went to Chino Valley to close out the season. They won, 47-27, to finish with an even record for the first time since 2005. Daulton ended 2011 with 1006 yards on the ground, becoming the first Panther to break the thousand-yard mark under Coach Ragan’s tutelage. He also scored ten total touchdowns, and the Arizona Daily Sun named him Athlete of the Year.